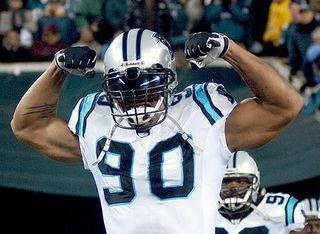 Julius Peppers would love to play for the Patriots . That much remains true. But while there has been a report that the Patriots are primed to make a deal for the Carolina Panthers defensive end, they have yet to drop a dime to his agent, who at this stage would need to broker such a transaction. Carl Carey, who represents Peppers, indicated last night he had not yet been contacted by Patriots coach Bill Belichick, or any other member of the organization. He claimed several other teams have asked him to gauge Peppers’ interest. Just not the Patriots. “No, they haven’t been in touch,” Carey said of the Pats, “but we have had preliminary discussions with GMs from other clubs in the league.” While Belichick didn’t comment on whether he had spoken to Carey, he did say on WEEI yesterday that in the cases of franchised players such as Peppers, he preferred dealing with the club, as opposed to an agent. Given Peppers has yet to sign his $16.68 million franchise tender, the Panthers cannot have conversations with other teams about him. Carey, however, can talk with teams and pursue a potential contract. After acknowledging there were no trade talks with the Panthers because there can’t be, Belichick sounded as if he was nudging Peppers to sign the tender, saying he didn’t like using an agent as a go-between.